Whether it’s a butterfly garden or a vegetable garden, developing a watering schedule for your plot is essential for beating the summer heat. Depending on where you live and your soil, your watering schedule can vary. If you’re not sure when or how much to water, there are several tricks you can use to improve your seasonal yield. Check out these tips from the landscaping experts at the Stoeckig Landscape Group to keep your garden blooming year-round. Whether you’re watering your garden or your grass, timing is everything. The best time to water is in the early morning hours before dawn. Watering in the evening increases the chance for disease and mold because the water sits on the leaves all night and doesn’t have the opportunity to dry. As the sun comes up and temperatures increase, any excess water on the plant’s leaves slowly evaporates, reducing the chance for mold and bacteria to take root. If you’re not sure how much to water, use the tuna can method. Place a tuna can in your garden and let the water run until it is full. During the summer months, high heat can quickly strip your garden soil of moisture. Maintain moisture levels throughout the day by laying mulch or straw around the base of your plants. In autumn, recycle fallen leaves and sprinkle them throughout your garden. As they decay, they will provide nutrients for both your plants and next year’s soil. Mulch and straw will also protect the roots of your winter plants from frost damage. Replace your mulch in the spring to avoid the spread of mold and algae. Ultimately, the frequency of watering is based on your climate and soil conditions. Use an indicator plant to determine when you need to water. Indicator plants like squash, melon, and cucumber, require lots of water. When they’re thirsty, their large leaves droop and develop a yellowish hue. It’s not uncommon for leaves to droop in the middle of the afternoon when temperatures are at their highest which why you should check your indicator plants first thing in the morning for signs of dehydration. 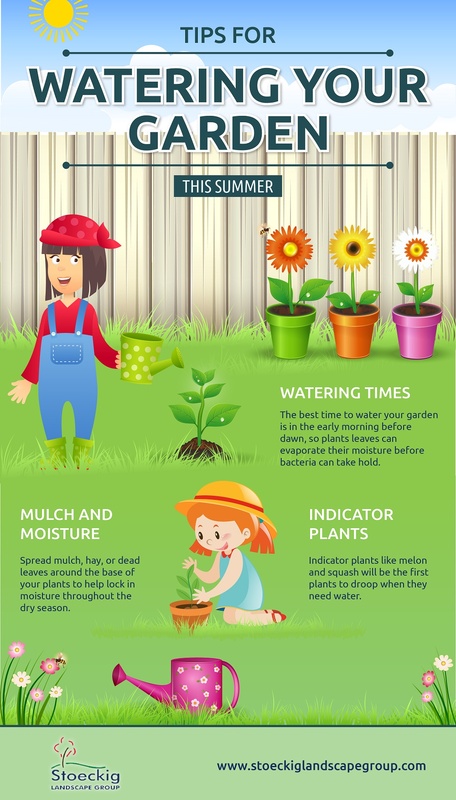 Make a note on your calendar of how often you water your indicator plants and use this information to develop a watering schedule that will anticipate your garden’s needs.